Given the Fiat 124 Spider’s relatively smooth ride, you won’t have to worry about liquefying your vital organs if you choose the firmer Abarth model. 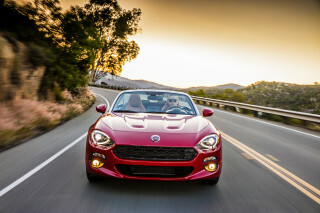 The Fiat 124 Spider takes the best from the Mazda MX-5 Miata, namely its agile handling and comfortable ride, while adding turbocharged power and Italian flavor. It’s truly a driver's car. The 2018 Fiat 124 Spider is a two-seater sports car that's related to the Mazda MX-5 Miata, but equipped with a different engine. One model year after its debut, the Fiat 124 Spider is little changed for 2018. A new Red Top Edition is added as an option, featuring a red convertible top, and the options lists for the Lusso and Abarth models are rearranged. From the outside, the Fiat looks nothing like the Mazda. In fact, the two cars share no body panels. That’s because Fiat styled its roadster using the same 90.9-inch wheelbase but added some length to the design and incorporated some features from the original 124 that was sold from 1966 to 1985. Inside, however, it’s hard to tell the two cars apart aside from some more soft-touch surfaces in the Fiat. The Fiat even uses Mazda’s infotainment system. The biggest change between the two cars lies under the hood. 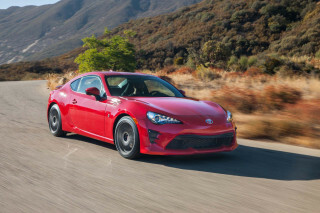 While the Miata is motivated by a naturally aspirated 2.0-liter inline-4 that makes 155 horsepower and 148 pound-feet of torque, the Fiat gets Fiat-Chrysler’s turbocharged 1.4-liter 4-cylinder that makes as much as 164 hp and 184 lb-ft of torque. Despite the Fiat’s better power numbers, the Mazda is quicker to 60 mph, though the Fiat has better passing punch. Both cars offer the same 6-speed manual and automatic transmissions, and fuel economy is very similar at 29-30 mpg combined. The Fiat 124 Spider owes its greatest strength to Mazda engineering. At just 2,436 pounds, it is extremely light, though about 100 pounds heavier than the Mazda. Still, the driving character is much the same: smooth riding with a some lean in turns, but very agile when driven hard and always smile-inducing. From a features standpoint, the 124 has modest base equipment and just a few options packages, but the value is undeniable. The Lusso model is the choice for those who want a few more amenities and the Abarth is best for those with a sportier mindset. Safety equipment is also basic, though some nice active safety features are optional. Classic sports car dimensions create an attractive shape for the 2018 Fiat 124 Spider, and nods to the original make it a bit longer than the Mazda Miata on which it is based. While the 2018 Fiat 124 Spider and the Mazda MX-5 Miata use the same platform, they look very different. That’s because Fiat has dipped into its own history to style the car, using cues from the 124 roadster sold from 1966 to 1985. Therefore, the cars share no body panels and the 124 is 5 inches longer overall due to design considerations that include extra length in the front and rear overhangs, most of which is at the back. While the Miata has a low-set scowling maw for a grille, the Fiat 124 has a higher-set honeycomb grille flanked by eyelid-signature headlights. Below the grille is an air intake of similar shape, and it is, in turn, flanked by foglights that are bisected by a line similar to the line between the top grille and lower air intake. The hood pays homage to the 124 of old, with depressions that mimic, in reverse, the powerdome bulges of the vintage 124. Along the sides, you see a character line that begins behind the front wheel, flows over the door handle, and kicks up over the rear wheel well into the top of the rear fender line. At the back, the Miata's rear end tapers or even sags, while the Fiat's sits more upright, extends farther, and emphasizes width. Overall, the Fiat 124 isn’t quite as butch as the Mazda, but it is still pretty, though pictures don’t always convey that fact. It should also be noted that Fiat changes the trim by model. The Classica has black and body color trim, the Lusso silver, and the Abarth gunmetal. The Abarth is also often paired with a black hood. Inside, Fiat made an effort to dress up Mazda’s design with better materials but the look is sports car simple. 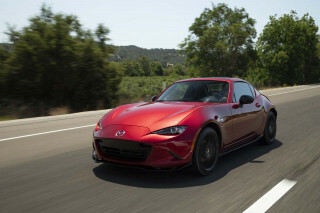 One design element Mazda employs is not present in the Fiat: Mazda makes the door tops body color plastic pieces to bring elements of the exterior into the interior. Fiat makes them soft-touch surfaces. Smooth riding and supremely agile, the 2018 Fiat 124 Spider is a joy to drive, though it’s small turbocharged engine struggles at the low end. It may be 104 pounds heavier than the Miata in its lightest form, but the 2018 Fiat 124 Spider still comes in at a featherweight 2,436 pounds. That allows it to jitterbug from one direction to another very willingly. 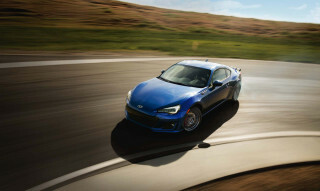 The ride is surprisingly supple, soaking up bumps like a family sedan, and you will notice definite body lean in corners. The fun, however, begins when the suspension takes a set and the car rotates crisply. At this point, that body lean becomes feedback as the car approaches the limits of adhesion, making it very precise and predictable to drive hard. The soft suspension leaves plenty of room for the Bilstein shocks and strut tower brace of the Abarth model. Those features only make the Abarth quicker to turn in and more responsive to driver inputs. The main difference between the Fiat and the Mazda lies under the hood. Fiat uses its single-overhead cam, turbocharged 1.4-liter 4-cylinder. 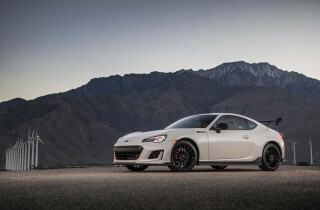 With as much as 22 pounds of boost to tap into, this engine produces 160 hp and 184 lb-ft of torque in base form, and the Abarth version makes 164 hp due to the better breathing of a unique exhaust system. By comparison, the Mazda’s naturally aspirated 2.0-liter inline-4 makes 155 hp and 148 lb-ft of torque. We find the Miata's engine is noticeably stronger from a stop due to the Fiat’s smaller displacement and a hint of turbo lag. The 124 takes 6.8 seconds to cover the 0-60 mph run, while the Miata can do the deed in 6.0 seconds. The Fiat likely has an advantage on the highway, however. Once its turbo is spooled up, it can deliver better mid-range passing response. The Fiat’s relative lack of low-end power is more noticeable with the automatic transmission, which is otherwise responsive; using the shift paddles can help here, but they are available only in the Abarth. Use the manual and rev it, and the issue can be somewhat mitigated. The Fiat 124 is great for short trips, but carrying large or small cargo or driving long distances aren’t its forte. The 124 shares the Miata’s interior layout and even its infotainment system with a rotating dial on the center console. The dial position behind the shifter can make it hard to reach without bumping your elbow against the bin in the back wall of the cabin. That bin is one of just a few interior storage options. It’s a small cubby, and there is a tray at the base of the center stack. Fiat provides two cupholders as stalks that can be moved around in three slots: two flanking that rear bin and one farther forward on the right side of the center console, where it brushes against your passenger’s left leg. Fiat makes some effort to improve upon the quality of the Miata’s materials, replacing hard plastics for the door tops and dash with soft-touch surfaces. The hood of the instrument panel is wrapped as well. To block noise, Fiat adds an acoustic windshield, a thicker rear window, polyurethane-backed carpeting, a dash panel insulator, glass-wool tunnel insulation, trunk area and rear floor insulation treatments, and a rear wheelhouse mudguard. This is still a sports car and it can be a bit noisy with the top up. Rear tire noise is still prominent, but overall it’s quieter than the Miata. The seats, however, are the same. They use a netting and urethane structure instead of springs. We think they are comfortable for a few hours at a time but have heard others say they lack long-trip comfort. We will have to weigh in on that when we drive the 124 over a long distance. The design of the 124 gives it a bit more length than the Miata, and that translates to a tad more trunk space. 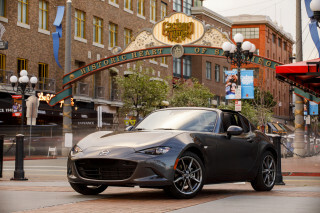 It offers 4.94 cubic feet of trunk volume compared to 4.59 cubic feet for the Miata. That’s just a smidge, but every little bit helps when you are talking such small volumes. Practically speaking, it’ll fit one piece of roll-aboard luggage or two soft-sided gym bags. The Fiat 124 Spider may not have crash test ratings, but it does offer some safety extras and its agility can help alert drivers avoid accidents. Fiat equips the 124 Spider with the requisite dual front and front side airbags, as well as traction control and stability control. Optional safety features include a rearview camera, rear park assist, and blind-spot monitors with rear cross-traffic alerts. 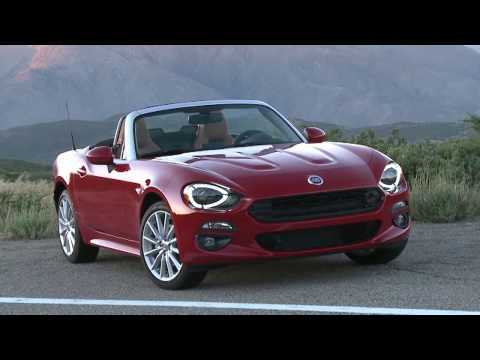 Neither the government nor the IIHS has crash tested the Fiat 124 Spider. Don’t expect either agency to do so, as sports cars tend to be relatively low volume and are usually not tested. We do consider the 124’s handling to be a safety feature. Alert and experienced drivers can use the car’s agility to evade crashes. We encourage all drivers (but especially sports car buyers) to seek out professional driving instruction to learn safety basics, such as braking distance and proper correction. The 2018 Fiat 124 Spider is a real value despite the fact that it has modest base equipment and just a smattering of options. 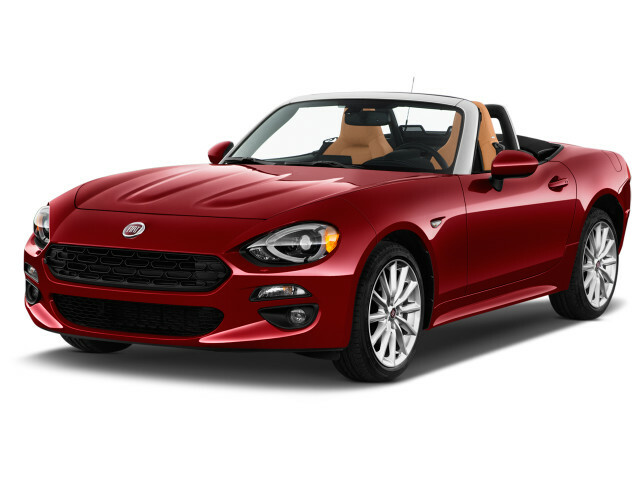 The 2018 Fiat 124 Spider is offered in three models: base Classica, luxury-oriented Lusso, and sportier Abarth. Standard equipment on the Classica model is mostly the basics. It includes cloth upholstery, a six-way manually adjustable driver’s seat, a four-way adjustable passenger seat, power windows, power locks, power adjustable mirrors, remote keyless entry, air conditioning, cruise control, a four-speaker AM/FM radio, Bluetooth connectivity, a USB port, an auxiliary input jack, a tilting steering column, and 16-inch alloy wheels. Optional for the Classic is a Technology and SiriusXM package with a 7.0-inch screen, a rearview camera, a multimedia controller, keyless entry, and satellite radio. The Lusso adds heated leather seats, keyless entry, automatic climate control, piano black interior trim, fog lights, rain-sensing wipers, and 17-inch wheels. The Lusso is also offered as the new Red Top Edition, which comes with a Bordeaux Red soft top, navigation, adaptive LED headlights, daytime running lights, and a nine-speaker Bose audio system. The Abarth model gets 4 extra horsepower thanks to a unique exhaust system; a limited-slip differential; Bilstein shocks; a sport mode selector that adjusts dynamic systems such as the engine, transmission (automatic only), electric power steering, and stability and traction control; a strut tower brace; firmer suspension tuning; a blacked-out hood; leather seats with microfiber inserts; a unique instrument cluster; aluminum-accented sport pedals; and a special steering wheel and gear shifter. Options for the Abarth include uprated Brembo brakes, Recaro sport seats, and a hand-painted hood stripe. The packages for the Lusso and Abarth are reconfigured this year, mostly by making larger packages into smaller ones. 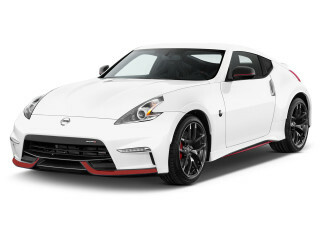 They start with a Comfort and Convenience package that has an alarm, auto-dimming and heated side mirrors, an auto-dimming rearview mirror, a universal garage door opener, blind-spot monitors with rear cross-traffic alerts, and rear park assist. The Navigation and Sound package adds navigation and a nine-speaker Bose audio system. The Visibility package comes with adaptive LED headlights with washers and auto-leveling, plus daytime running lamps. A small car with a small displacement engine, the Fiat 124 Spider goes easy on gas while delivering smiles per mile as well. Fiat and Mazda take different approaches to power and fuel economy, and Fiat generally comes out on top in terms of efficiency. Both automakers recommend 91-octane fuel for best performance.